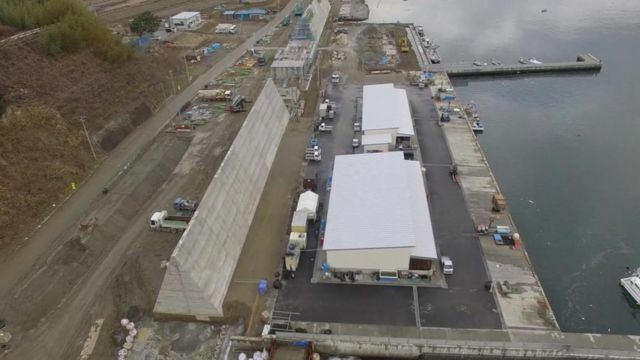 Drone video of Japan's new tsunami sea wall Jump to media player Drone video shows the new sea wall that is being built in the waterfront area of Rikuzentakata, Japan to protect the town from future waves. 'I feel very lucky': Hinako's story Jump to media player Hinako will never forget the day that a tsunami hit her home in Japan. Leah spoke to her about what happened. How to prepare for an earthquake Jump to media player Leah travelled to Ishinomaki Elementary School to find out how school kids across Japan learn how to stay safe if there’s an earthquake. Aerial footage of a Fukushima radioactive waste dump Jump to media player Drone footage of a radioactive waste storage facility in Fukushima. Has Fukushima's radiation threat been exaggerated? Jump to media player The BBC's Rupert Wingfield-Hayes visits Fukushima and measures radiation levels to examine whether they should still be considered dangerous. The Japanese tsunami five years on Jump to media player Leah visited Japan to find out what life is like for people there five years after an earthquake triggered a tsunami that caused devastation in the country. Leah meets kids still affected by the Japanese tsunami Jump to media player Nearly five years after Japan was hit by a powerful earthquake and tsunami, Leah went to meet some of the children still affected by what happened. Five years ago, a giant earthquake and tsunami hit northeast Japan leaving more than 18,000 people dead or missing. The huge tsunamis created by the magnitude 9-quake wiped out entire villages along the coastline. A new sea wall is being built in the waterfront area of Rikuzentakata, to protect the town from future waves.